To better connect customers' U.S. and Central American supply chains, Crowley Liner Services will begin fixed-day, weekly sailings on Wednesday, Aug. 9, directly between Florida and Costa Rica and Panama. The new service offers fast transits to speed cargo to market at peak times. To better connect customers' U.S. and Central American supply chainsr, Crowley Liner Services will begin fixed-day, weekly sailings on Wednesday, Aug. 9, directly between Florida and Costa Rica and Panama. The new service offers fast transits to speed cargo to market at peak times. 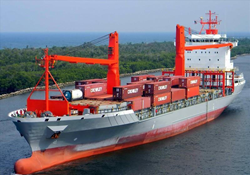 Crowley's vessels will sail southbound from Florida on Wednesdays from the Port of Jacksonville, and Fridays from Port Everglades, and will arrive on Tuesdays in Puerto Limon, Costa Rica, and on Wednesdays in Manzanillo, Panama.